"You have nothing to worry about. The Holy Mother will guide you." The Arc The Lad saga stretches on, and in Volume 3, ADV seems to have switched to a 5-episode disc format, offering a much better way to absorb the series. In a way, this volume might be referred to as "the answer volume," as many questions are explained and the plot tightens up a bit. Some mysteries are solved, but new ones open up. At the close of Volume 2, our heroes Elk, Lieza, and Pandit found themselves stranded on a small island. Separated from Shu, their other companion, they have no choice but to simply wait things out until Elk can fix their airship. The story picks up when they finally manage to leave the island and head back to the city of Prodias. Once back in Prodias, Elk and Lieza locate Shu, only to leave him again because they've had bounties put on their heads. As wanted criminals, Elk and Lieza have no choice but to flee Prodias immediately. They decide to go to Lieza's home village, hoping to find it still intact, despite the current war between the two nations. The journey to the village, however, will bring the whole series, so far, to a crucial turning point, as Elk discovers many things, including the location of White House and the fact that his childhood friend, Merril, may still indeed be alive inside that organization. They also encounter the 'Nameless Crusaders', a mysterious group of religious missionaries that offer medical relief to those harmed in the war. Are they actually good guys, or just another government controlled organization? The plot thickens when Elk finally meets Arc, the mysterious revolutionary who is considered the most dangerous man in the world. Elk's life goal of destroying Arc will have to take a backseat, however, to more important concerns. Elk has discovered many things about his past that aren't true, and he basically must re-evaluate everything he hoped to accomplish by locating White House. Meanwhile, the government of Prodias expands their program to use White House to engineer more Chimera beasts. As you can see, a lot happens here in this volume and, in many ways, it closes much of what the series was before. This is no longer a simple, adventurous quest; Elk now finds himself realizing his idealistic mission of personal revenge doesn't mean anything anymore. Arc takes on a darker tone, but also a tone that's more hopeful, as if the future could truly bring great changes that will help the whole world. Again, patience is a rewarding virtue with Arc The Lad. It moves slowly, but the dramatics and dialogue are superbly crafted. This is a rather slow-moving group of episodes, with very little action, but I honestly didn't care or really notice. Subtle details are often the most intriguing and touching, and they're handled expertly. This is a beautiful series, far more concerned with story and character development than anything else, and it does most of it using very restrained techniques. The focus is now much narrower, given that so much is wrapped up in these 5 episodes. The next volume (also 5 episodes) should bring a whole new manner to the presentation. Image Transfer Review: Another quality transfer appears here, and it's just as high-end as the other volumes. In a few, minor moments, there's some slight background shimmer and movement, but otherwise, a very cel-like image. Audio Transfer Review: The Dolby 2.0 soundtrack is clean and very fitting. Dialogue is mainly in the center channel, with music and sound effects using stereo soundfields. Surround channels get a few, minor moments of usage, but it's very quick and fleeting. Things still sound very good though, with no complaints really. The English dub is of good quality and, unlike some dubs, does not drastically alter the tone or story elements. Extras Review: While there no extra features (other than the usual reel of ADV previews like, Farscape, Nadia, Ruin Explorers, and Orphen), I'm very pleased to report the new direction ADV seems to be taking Arc by presenting 5 episodes per disc instead of 3. This makes the discs much more worth the purchase for fans, and it allows the story to bloom much better. Because of the slow nature of the show, the 3 episode format was frustrating, because it left way too much hanging at the end of each disc. Now, if they continue this, it will allow the stories to close a disc with a sense of "let's move on to the next chapter," rather than an abrupt closure. Still, it would be nice to see a future volume include some conceptual drawings and features of that type. 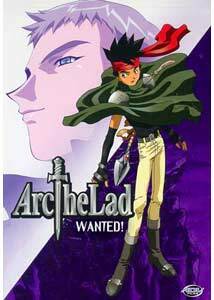 Arc The Lad is, in my opinion, a masterpiece of modern anime. A brilliantly-told saga, filled with heart and intensity. If anyone didn't particularly like the first 2 volumes, I'd suggest giving the third a try, since it flows better. Certainly, this one of the best pieces of anime I've ever seen that is bases on a video game.